Bayrl, Bayerl, Baÿrl, Baÿerl, Brüstle, Engelhard, and Engelhardt Families of Dinkelsbühl. The Bayerl (Baÿrl, Baÿerl) Family of Affing, Dinkelsbühl, and Nürnberg. Of my paternal great grandparents, I knew the least about my grandmother’s father, Xaver Jakob Bayrl. Although tragically I never met any of them, the other three were still living in Nürnberg in the 1950s. Xaver had died in 1936 and I am not sure I had even seen a photograph. It is therefore with some satisfaction that I have been able to piece together at least an outline of his life and I have hopes to find additional relatives. When I found my own father’s baptismal record in a dusty Nürnberg volume, I discovered that he had been named after Xaver who was also his Godfather. (I had always assumed he was named for Francis Xavier.) Among my parents affairs I also found two or three precious photographs of Xaver that belonged to my grandparents and my great aunt Barbara. 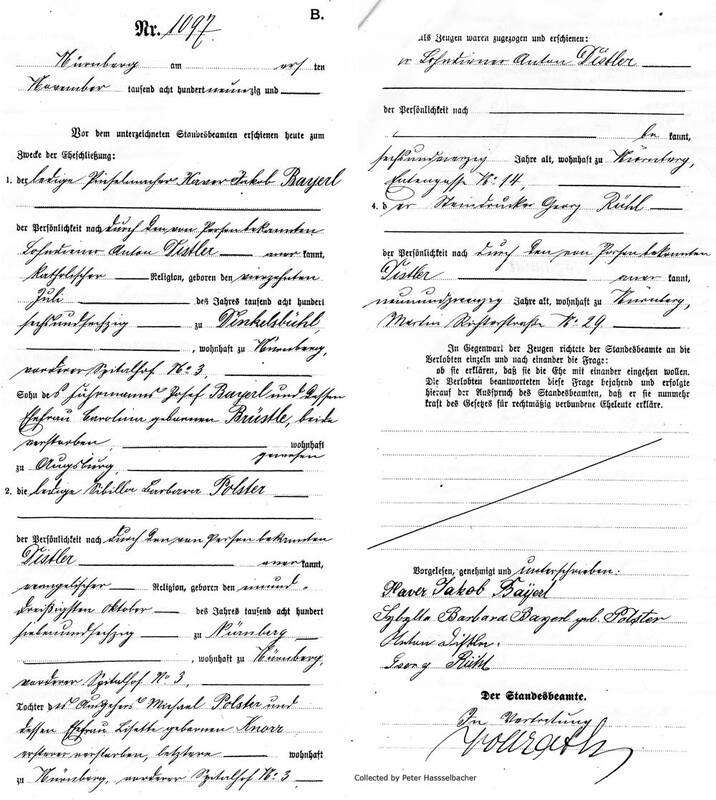 The largest increment of information came when in Nürnberg I found the 1890 marriage certificate of Xaver. He was described as a single (not previously married) brush maker (Pinselmacher) of the Catholic faith, born July 14, 1865 in Dinkelsbühl. He was living at Spitalhof #3. His father had been Josef Bayerl and his mother Carolina (maiden name Brüstle). Both his parents had already died (beide verstorben). Joseph had last lived in Augsburg where he was a coachman (Fuhrmanns). Xaver married Sibilla Barbara Polster who was born October 31, 1867 in Nürnberg. She too had not been previously married and was of the evangelischer religion. (Many interfaith marriages in my family!) Her father was Michael Polster, who had already died, and Lisette (maiden name Knoor) who was also living in Spitalhof #3. Michael’s name is preceded by the label “Ausgeher” which if it is an occupation, means messenger. (I also have the marriage record of Lisette’s parents.) Both the bride and groom signed the marriage record in their own hand as will be discussed at length elsewhere. I know a little more about the children of Xaver and Barbara. Indeed I am aware of living descendents not of my immediate family who I have not been able to find. The breakthrough piece of information in this marriage record was that Xaver was born in Dinkelsbühl, a very old medieval city some 90 km southwest of Nürnberg on what is today Germany’s “Romantic Road. I had previously discovered the first appearance of Xaver in the Nürnberg street directory in 1891 where he was already a brush-maker (borstenzurichters). Like so many others from the countryside during the industrial revolution, he had come to the big city to make his life. He must have married soon after. Last year I traveled to Dinkelsbühl. I will post additional photos from that visit elsewhere on the site. 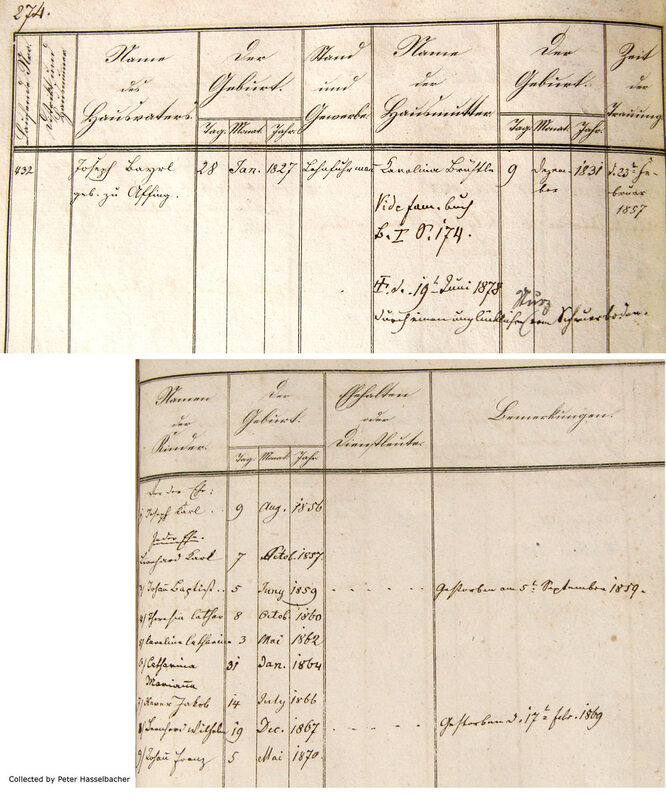 In the too-brief time available I was able to examine the church books at St. Georg’s Church where I saw the family register of Xaver’s parents, and indeed their marriage certificate. Last month I was able to look at the microfilm of those church books courtesy of the Church of latter-day Saints. Fortunately for me, some kind and diligent soul had gone back and alphabetized all the baptisms in Dinkelsbühl from 1568 through 1815. Looking backwards through this index there were at least three dozen individuals with a name similar to Bayrl. The majority of these were spelled Bayrle, with a scattering of Baier, Beirle, Bayr, Baur, and Beirlin. In all of the baptismal records up to 1815, there was only a single Bayrl, and that was in 1669. After 1730, only the Bayrle name (and one Bairle) was still appearing in the record, and even this disappeared by 1790 when the family registers I have begin to be compiled. I still have several microfilms to go through and will add information as I find it. It quickly became apparent that I was not going to be able to easily trace the Bayrl family back in time in Dinkelsbühl. 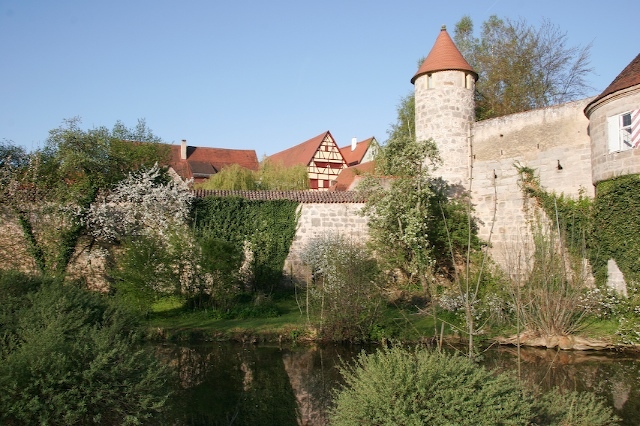 As I learned to translate these old documents, the reason for this became apparent: although Xaver was born in Dinkelsbühl, his father, Leonhard, was from Affing, a tiny village about 100 km to the southeast and near the town of Augsburg. All of a sudden, a geographic and temporal framework began to fall into place. The Family Register #274 and marriage certificate of Joseph Bayrl and Carolina Brüstle tell us the following. Joseph was born in Affing on January 28, 1827. He was described as a Lohnfuhrmann in which I interpret to be a hired coachman. He was Catholic and in Dinkelsbühl lived in House Number 103. His father was Leonard Bayrl who was a Gutler (small farmer) from Affing, and his mother’s maiden name was Crescenz Helfer. Carolina Brüstle was born December 9, 1831. Her maiden name is the same as her mother, Catharina Brüstle who remained unmarried until Carolina was 11. Catharina married Franz Joseph Engelhard in 1842 and had several children with him. The baptismal index reveals Brüstles in Dinkelsbühl as early as 1803, including a baptism of a Catherine Brüstle on February 13, 1813 but I have not yet been able to assemble this information. Joseph’s Bayrl's wife Carolina died in Dinkelsbühl on June 19, 1878 at the age of 46. Her youngest child would have been eight years old, and her oldest 22. Joseph and Carolina are listed with nine children. Their details will be listed in the family tree sections of this site. Their first child, Joseph Karl, was born in 1856 before the marriage of his parents. Xaver is child #7. Of the others, two children born in 1859 and 1867 died in infancy. Significantly, there is no date of death listed for any of the other children, nor for Joseph himself. Neither is a second marriage listed for Joseph. It is reasonable to speculate that following the death of Carolina in 1878, that Joseph may have returned with his family to Augsburg where he lived in the final years of his life dying before 1890. Because of his occupation as a coachman or wagoner, Joseph would have been in a position to meet a woman in Dinkelsbühl, fall in love, and raise a family there. He may have returned to Affing/ Augsburg to remarry or benefit from the resources of other family in raising his children. There are many Bayerls living today in Germany, including some in Augsburg. There are only a handful of Bayrls. It is of interest that Xaver Jacob had a younger brother named Johann Franz (child #9), and an older sister named Katharina Marianna (child #6). These would have been the uncle and aunt of my Grandmother Lena (Karolina Katharina) and her sister Dorothy (both of whom married Hasselbacher brothers). Lena and Dorothy themselves had children named Franz and Marianna. Of interest is that I have also identified at least two other Baÿerls in the village, Andreas and Carolina. Additional names were found. In such a tiny place it is likely that the three contemporaries were related. We are given the name of the parents of Andreas: Rupert Baÿerl who died 10 Aug 1819, and his wife Barbara Ellinger born 11 Dec 1786, and who died 20 Jan 1862. There are many other names associated with this family and it will be fun to sort them out. I have access to birth, death, and marriage records from Affing into the early 1700s. 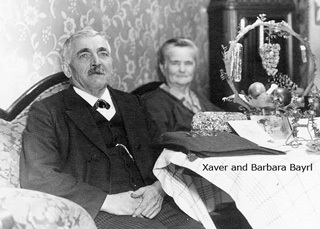 I have seen Xaver’s family name spelled in different ways: Bayrl, Bayerl, Baÿrl, and even Baÿerl. As was true for my family name “Hasselbacher,” the church scribes and ministers wrote down the name they heard often spelling it in different ways. In the Dinkelsbühl Church books, Leonard and Joseph’s names are also spelled in different ways. However, as will be discussed elsewhere, when signing their names, even the family members themselves spelled their name differently. Without additional information or expertise, I will have to live with some ambiguity. The most frequent usage throughout Germany today appears to be Bayerl: there are many in the German phonebook. There are fewer than 20 Bayrls and no Baÿrls (although this latter may be a technical artifact related to the internet). It seems likely that Bayrl or Bayerl refers to or is related to the old German word for Bavaria.